Sensei Jonson started formal karate training in 1970. Earned a Shodan in Okinawa Isshinryu Karate and a Sandan in Hawaiian Kujukempo Karate before being accepted into the All Okinawa Shorin-ryu Kenshin-Kan Karate and Kobudo by Master Fusei Kise as black belt no rank student. He was trained on Okinawa by Master Kise and Kyoshi Isao Kise 1979-1984; 1987-1988; and 1989-1993. He has taught for and along side Master Kise and Sensei Isao on all the military bases on Okinawa and the main DOJO. He has represented the main DOJO in tournaments and demonstrations on and off military bases on Okinawa. He has taught black belt training classes at the main Dojo. While on Okinawa, he was Okinawa Shorinryu Kenshin-Kan Karate Kobudo Association then federation correspondence secretary for all correspondence coming to Okinawa from the dojos around the world. Sensei Johnson has been a tester for the Okinawa Shorin-ryu Kenshin-Kan and Kobudo Federation at the main Dojo promotion and weapons testing. Sensei Johnson was the senior American black belt instructor representing the main Dojo in the opening ceremonies for the all Japan games (kokutai) – Okinawa, Japan in October 1987. Sensei Johnson has had dojos in Pearl Harbor, Hawaii; Camp Lejeune North Carolina and Yuma, Arizona and presently in Memphis, Tennessee. He was promoted to Godan in 1984 and directed by Master Kise to use the title of Shihan, also qualified for Godan in all the Kenshin-Kan Godan Kobudo. Sensei Johnson was verbally told to use the rank of Rokudan by Master Kise during his annual visit 1987 to Sensei Greg Lazarus’s Dojo in Dover, New Hanpshire and Sensei Johnson was Sensei Lazarus’s guest during Master Kise’s visit. 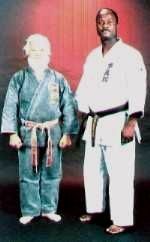 Sensei Johnson was officially tested and promoted to Rokudan in 1991. He was certified Rokudan in Kobudo (Bo, Sai, Kama), Tuite and International Police Self Defense Instructor in 1995. He retired from the U.S. Marine CWO4 after 30 years of active duty on February 1, 1996. If you would like to be added to the instructor list you must fill out all the fields below. Website designed by Higher Images Inc.